A good way to make your resume stand out from every other resume is to turn all of your past work experience into those sweet lil' tattoos that adorn the rear of every My Little Pony (I KNOW they are called "Cutie Marks" because I Googled but I didn't want to be esoteric with my knowledge; please don't yell at me if you are a Brony.) It's debatable if that "standing out" a good kind of standing out. It's the most exciting resume I've ever read. All of the horse metaphors! The beautiful rainbow! The sentence "he even had his own nuclear reactor to play with"! The only hazardous thing I get to "play with" at work is a tabloid photograph of Miley Cyrus French-kissing someone in a giant infant mask. 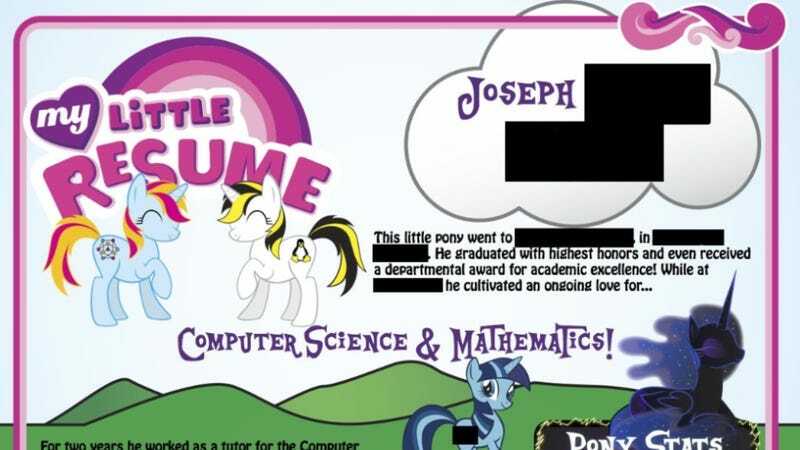 An enterprising commenter on Dorkly has tracked this pony-gilt document of work experience to its source — so it looks like it's not a joke. Good for you, Joseph. Be proud of your hobbies. Don't let the man get you down.